How many pallets can I get on my van? Millions of pallets are moved around the UK every day, helping commerce and industry function effectively and keeping the lifeblood of Britain’s economy flowing. Not all of them are moved on the back of lorries, however, with thousands of individual loads being transported in commercial vans. Here is a look at the information van drivers need to know. How many pallets you can carry safely depends on the size and weight capacity of the vehicle which is being loaded and driven. Over the years, van manufacturers have realised their importance in transporting goods and equipment and designed their vans accordingly, usually based on the standard dimensions of 1,200 x 800 x 400 mm. 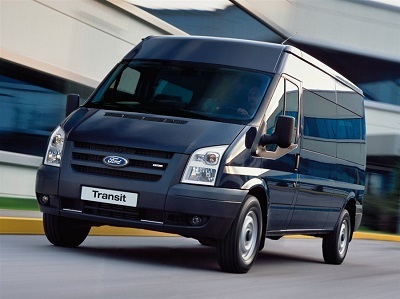 One of the best-selling commercial vehicles in the UK is the Ford Transit van, which, depending on the wheel-base length you opt for, can accommodate three placed end to end in its short-wheel-base model, four in its long-wheel-base van and up to five in its Jumbo van. Other van manufacturers offer similar load capacities in their ranges of vehicles. However, an important safety feature to consider is not only how much a van can accommodate, but how heavy the load is and whether the load is evenly distributed and secured correctly. To establish the maximum load weight your vehicle can carry you should consult the owner’s manual. Bear in mind that this figure is for the total weight of items being carried in the van at any one time, not just wooden pallets and their load. This means that any tools or equipment also stored in the vehicle will have to be factored in, as well as the weight of the driver and any passengers and how much fuel there is in the tank. 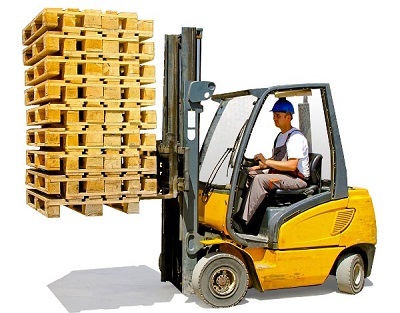 The Health and Safety Executive have issued clear and sensible guidance about loading and unloading wooden pallets from commercial vehicles to avoid accidents and prevent injury. More details can be found on their website but in summary they suggest that loading and unloading should be: undertaken in an area which is free from other traffic and pedestrians; done on level ground; only carried out by properly trained personnel; covered by a comprehensive commercial insurance policy. The loads themselves should be: distributed as evenly as possible; secured firmly to avoid slipping or moving during transit; protected adequately, for example through the use of stretch wrapping; in good condition. If your commercial vehicle has a side door, you may be able to load through that. Otherwise the load will have to go in and out of the van’s rear doors. Such loading should only be undertaken by a fork-lift truck (FLT) operated by a fully trained driver, in order to minimise the risk of accidents and injuries. When considering which van to purchase, you may want to ask if the rear doors open at a wide enough angle for effective loading – some vans offer up to a 256-degree opening angle, which can be useful to facilitate efficient loading.